Meet an Author-Turned-Bookseller-for-a-Day at Gibson’s Bookstore! After the turkey and the battle with the crowds on Black Friday, it’s time for something different. Take a book break, and get some holiday shopping done in a friendly atmosphere while supporting a local business in your own community. On Small Business Saturday, four terrific local authors will become booksellers-for-a-day at Gibson’s Bookstore. Come into the store and ask Joe Monninger, Howard Mansfield, Sy Montgomery and children’s author David Elliott for recommendations for the people on your holiday gift list—and maybe pick up a couple of the authors’ signed books, too. 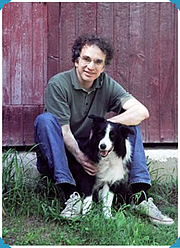 Joe Monninger, who teaches at Plymouth State University, is the author of many novels for adults and for young adults, including Margaret from Maine and Wish. Joe will be in the store from 10:00 a.m. to 1:00 p.m.
David Elliott lives in Warner and is the author of many children’s books, including The Cool Crazy Crickets Club, In the Wild (with Holly Meade), and Jeremy Cabbage. David will be in the store from 10:00 a.m. to 1:00 p.m.
Howard Mansfield and Sy Montgomery are married and live in Hancock. Howard is the author of The Same Ax Twice and most recently Dwelling in Possibility. Sy is the author of The good good pig and many other books for all ages on science and nature (Spell of the tiger, The Snake Scientist). Howard and Sy will be in the store from 1:00 p.m. to 3:00 p.m. The idea of authors becoming booksellers for a day on Small Business Saturday was first hatched by Sherman Alexie. Hundreds of bookstores and authors are joining in the fun, all over the country. Read more about this effort here. The mystery that attracts Howard Mansfield's attention is that some houses have life--are home, are dwellings, and others aren't. Dwelling, he says, is an old-fashioned word that we've misplaced. When we live heart and soul, we dwell. When we belong to a place, we dwell. Possession, they say, is nine-tenths of the law, but it is also what too many houses and towns lack. We are not possessed by our home places. This lost quality of dwelling--the soul of buildings--haunts most of our houses and our landscape. Peterborough - Howard Mansfield autographing and discussing "Dwelling In Possibility: Searching For The Soul Of Shelter"
Howard Mansfield autographing and discussing DWELLING IN POSSIBILITY: SEARCHING FOR THE SOUL OF SHELTER The mystery that attracts Howard Mansfield's attention is that some houses have life, are homes, are dwellings, and others do not. The book is a search for the ordinary qualities that make a house a home, and some public places more welcoming than others. When Howard Mansfield and his wife Sy Montgomery were house hunting back in the days of booming real estate values he asked himself “why is it that some houses have life - are homes, are dwellings – and others don’t?” “Dwelling “, he writes, “is an old fashioned word we’ve misplaced. When we live heart and soul we dwell. When we belong to a place we dwell.” Noun or verb, what are the qualities of dwelling? This is not a book of answers with a checklist of features for the house hunter. Instead it is a thought provoking book that dwells in our historical and cultural attitudes to home. The book opens with his and Sy’s personal experiences with the great ice storm of December 2008. In the absence of electric power their home returns to its more primal purpose as shelter, and the inhabitants to the participatory role of stoking the fire and lighting candles. Gathering round the table and stove is a reminder of the old idea of home with the hearth as focus – a focus lost in the world of electric lights and furnace. In a chapter on clutter he reminds us of the minimal furnishings of colonial homes and the excessive stuff brought home in our material age. The town of Hancock’s plans to redesign the sidewalks offers insights into the timeless relationships of land and building. He concludes “we want to live in houses and towns that are comfortable, ordinary, and profound.” The importance of home to the human spirit he finds revealed in the words of Annie Card, a Hancock resident helping to rebuild houses in the wake of Hurricane Katrina – ask the children “to draw what they want and they draw a house.” “They want to go home again.” And he quotes architect Samuel Mockbee “Every man, rich or poor, deserves a shelter for the soul.” World War 11 ended in terrible acts of firebombing houses by the Allies. Why? “having one’s home demolished is most damaging to morale” said a British war advisor. The goal - to damage morale to the point of a quick surrender. After the war people “flooded back” to the cities. Howard quotes a survivor “it’s better to live in a cellar in ruins than be a refuge.” In rebuilding Europe city planners wanted a clean slate, a chance to modernize with wide streets and bigger lots. But the citizens wanted the old skyline, the narrow streets, the whole familiar ensemble. Three philosophers weighed in on the qualities that must be inherent in the new housing if they were to be true “dwellings”. Here Howard helps us through the thinking of Heidegger, Picard, and Bachelard to confirm the dwellings must “honor the ordinary as sacred, of being at peace” (Heidegger), be a place where silence can dwell and continuity be established (Picard), and be “a house that shelters daydreams” (Bachelard) . Drawing frequently on the writings of Christopher Alexander he notes that in constructing design should unfold with the builder following tradition in a step by step process that creates “a lovely harmony”. To dwell properly “ we need to simplify. We have to restore the ordinary – the ordinary that lives in shadows, quiet, talk, the hearth.” “ What matters most can not be named”, he says, but with this book he has successfully teased out the qualities we desire. Is your house a good place for daydreaming? – then perhaps it has that “quality without a name “ - and you do dwell in possibility. Howard Mansfield reads from Turn and Jump: How Time and Place Fell Apart. Howard Mansfield signs Hogwood Steps Out: A Good, Good Pig Story. "Howard Mansfield will be joining us to celebrate as Christopher Hogwood “steps out” in a wonderful new children’s book. We know about “this great Buddha of a pig” from the adult memoir The Good, Good Pig by Sy Montgomery, who is Howard Mansfield’s wife. Barry Moser has illustrated this charming story with remarkable pig portraits. This story was written before The Good, Good Pig and is an entirely different story about this fine porker. Howard Mansfield's book The Habit of Turning the World Upside Down is currently available from LibraryThing Early Reviewers. Howard Mansfield is currently considered a "single author." If one or more works are by a distinct, homonymous authors, go ahead and split the author. Howard Mansfield is composed of 2 names. You can examine and separate out names.